ALL IN THE FAMILY — Fourth-generation farmer Jake Kyle holds his daughter Elly in one of the Kyle & Kyle Ranches alfalfa fields in the Wanda Mia Ranch. CLOUDY FUTURE — Brandon Calandri, the last onion farmer in the Antelope Valley, stands in an empty onion warehouse at property that is under escrow to a marijuana company. Gary Van Dam of High Des­ert Dairy/Van Dam Broth­ers (above) is the Valley’s last dairy farmer. CLOUDY FUTURE — Gary Van Dam of High Des­ert Dairy/Van Dam Broth­ers (above) is the Valley’s last dairy farmer. LANCASTER – The sweet fra­grance of onions permeated the air during a recent visit to Cal­andri Farms’ Lancaster fac­ility on 70th Street East and Avenue K.
“If you love your stew this is the place to hang out,” Brandon Calandri said. Calandri is a third-gen­er­ation onion farmer. His late grandfather John Calandri Sr. started onion farm­ing in the Antelope Valley in 1958. His father, John Calandri Jr., picked up the family bus­iness and also farmed for decades before he retired. At one point there were 29 onion farmers working about 5,000 acres in the Antelope Val­ley. There is a fraction of that left now. “I’m the last one,” Calandri said. Calandri grows white on­ions and red onions. You can pur­chase them locally in Stater Bros. Markets and Vallarta Su­per­markets. The Antelope Valley’s ag­ri­cul­tural legacy is endangered. The blame can be attributed in part to California’s higher labor costs and a 2015 court sett­le­ment that set limits on ground­water pumping for users across the Valley. “We face a lot of obstacles now,” Julie Kyle of Kyle & Kyle Ranches. The Kyles lost more than half of their water through the adjudication class action suit. Kyle, her husband Gailen, and son Jake are third- and fourth-generation farmers. The family grows alfalfa, grain hay and wheat. Their farming roots date back to 1935 when Gailen’s family came to the Valley. Julie’s fam­ily of Basque sheepherders ar­rived in the Valley in the 1950s. “We have a long history of farming and agriculture in this area,” Julie Kyle said. Jake Kyle intends to continue with the family business, Julie Kyle said of her 28-year-old son. “We’re going to do ev­ery­thing we can to continue farming. We’re not going to go easily, let’s put it that way,” Julie Kyle said. Some longtime farmers left the Antelope Valley for other parts of the state. Some farmers left Cal­if­or­nia for other states, and others retired. “They didn’t leave be­cause business was good, Cal­andri said. Some California farmers moved their operations to Mex­ico where the labor and water costs are significantly less. At one point more than 70,000 acres of alfalfa were growing in the An­tel­ope Valley. Less than 10,000 acres re­main. There used to be a few thousand acres of fruit, cher­ry, and almond trees, and almonds. There are no more almonds growing in the Valley. There are some you-pick orchards in the west­ern part of the Val­ley, such as Villa de Sol in Leona Valley, the largest you-pick cherry orchard in South­ern California. But agriculture in gen­er­al in the Valley has been disappearing fast. “Ag is virtually dead in the Antelope Valley. There’s just not many left,” Cal­an­dri said. The former Gene Wheel­er Farms onion facilities on Avenue H-6 near Tre­vor Av­en­ue were sold to a med­ical marijuana com­pany. Calandri’s facilities on 70 th Street East and Avenue K, and another one on Avenue L are in escrow for a marijuana company. Calandri and his part­ners in SoCal Farms LLC are looking at another crop to extend the Valley’s ag­ri­cul­tural legacy — industrial hemp. “It’s being done with the best intentions,” Calandri said. Hemp is used in thous­ands of different products. It is used as a binding agent in concrete instead of rebar. It is used in paper, clothing, and rope. Hemp can also be used to make biodegradable plastic. You can even make hemp straws. Although hemp and mar­i­juana are members of the can­nabis family, the main dif­fer­ence be­tween the two is that mar­i­jua­na can con­tain up to 30% of the psy­cho­active tet­ra­hy­dro­canna­binol, or THC. Hemp con­tains less than 0.3% THC. Industrial hemp also con­tains a relatively high percentage of cannabidiol, or CBD, which negates THC’s psychoactive effects. Calandri and his part­ners in SoCal Farms, a lim­ited liability company, will conduct a research project in col­lab­o­ration with Antelope Valley College to see where the hemp market will take them. “We’re interested in maybe doing some un­der­grad­uate student research on plants,” said Les Uhazy, AV College’s dean of Math­e­mat­ics, Science and En­gin­eer­ing. AV College students will have an opportunity to get involved in learning plant science through industrial hemp. “For students it’s a great opportunity. We have as a goal to try to enhance our plant sciences program,” Uhazy said. SoCal Farms will pro­duce hemp derived biomass, crude oil, and isolate. “It’s an opportunity that we need to seize because the agriculture industry in the Antelope Valley has suffered tremendously over the past years,” Calandri said. One of the benefits of growing industrial hemp is that it takes less water to grow. Alfalfa requires about seven-acre feet of water per year to grow. Onions take four-and-a-half acre-feet of water per year, Hemp takes about two-and-a-half to three-acre feet of water to grow. Calandri expressed thanks to local politicians such as for their support of local agriculture. State Sen. Scott Wilk, R-Santa Clarita, wrote Sen­ate Bill 1409, which le­gal­ized hemp farming in Cal­if­ornia. Former Gov. Jerry Brown signed it last year. The bill became law on Jan. 1. “I knew nothing about hemp when we started, It was the local farmers out there who reached out to me,” Wilk said. The local farmers reached out to Wilk to help get state law in compliance with federal regulations so they could grow industrial hemp. “It’s got many positive attributes,” Wilk said. In addition to taking less water to grow industrial hemp can also help rejuvenate the ground and sequester carbon. Wilk has a “clean up” measure, Senate Bill 153, for this year’s legislative ses­sion to bring the state into compliance with the la­test federal Farm Act, which legalized in­dus­tri­al hemp with some re­stric­tions. “With this hemp in­i­tia­tive it’s going to allow our far­mers to remain in ag­ri­cul­ture,” Wilk said. Wilk expects to the laws to go into effect by 2021. 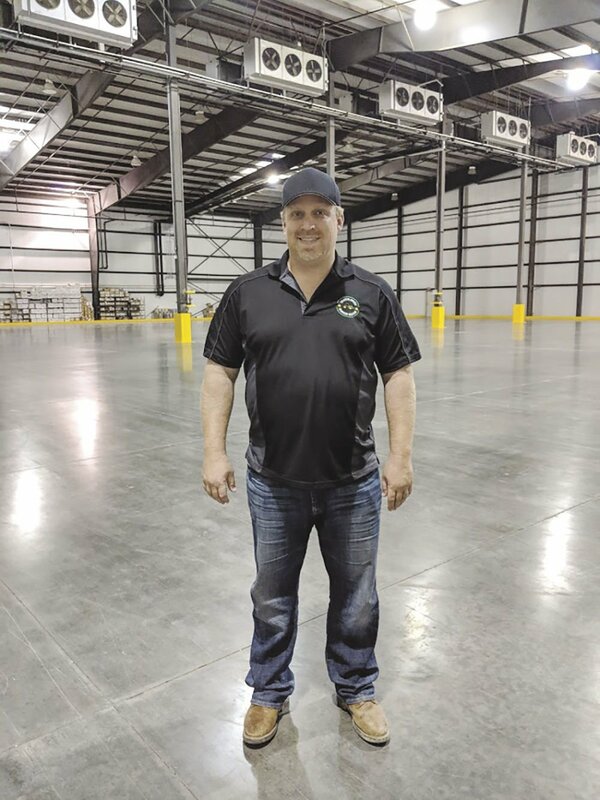 The future of industrial hemp in the Valley could also lead to a manufacturing mecca in the Valley that would allow fam­ilies to stay and work at home, Wilk said. “I’m really excited about this initiative,” Wilk said. Calandri looks to plant his first crop of hemp next month. It should be harvested in August. Calandri said they will work hand-in-hand with AV College on all aspects of the crop, including water consumption and the crop’s carbon footprint as well as the potential economic impact. The hemp grown by SoCal Farms will be or­gan­ically grown. They are also the first to re­ceive per­mission from the Los An­gel­es County Ag­ri­cul­tural Com­missioner. “We are meeting all federal and state regulatory requirements to be able to operate. … Which has been a challenge, it’s been about a two-year process,” Calandri said. “I’m thankful that I’m facing the struggles that I’m facing here with the po­litical environment that we have here but they really do try,” Calandri said. Calandri credited city leaders such as Lancaster Mayor R. Rex Parris, Vice Mayor Marvin Crist, and Palm­dale Mayor Steve Hof­bauer who want to keep the local agriculture industry viable. “I really appreciate it,” Calandri said. Crist said they try to help local farmers through agen­cies such as the An­tel­ope Valley Air Quality Man­age­ment District with grants to up­grade heavy duty equip­ment such as tractors with lower emissions vehicles. They also work with local farm­ers through the Los Angeles County Sanitation District No. 14. “We own a lot of property with the Sanitation District and so we have them farm that land so it’s not a dust bow,” Crist said. Crist acknowledged local farmers are going through a lot right now. “We don’t want to lose our heritage. That’s what the Antelope Valley is about,” Crist said. Farmers also help with the Valley’s air. “There’s a lot of land out here that are farmed by farmers. We would have a lot more dust in the air if it wasn’t for the farmers,” Crist said. The local farmers not only employ a lot of people they also give back to the community. Gary Van Dam, of High Des­ert Dairy/Van Dam Broth­ers, is not only the last dairy farmer in the An­telope Valley, he’s the last one in Los Angeles County. Back in the ’40s and ’50s there were 13 dairy farms in the Antelope Valley. “Our fear is that with these water restrictions the dairy farm will be sev­ere­ly cut back on feed. We’re def­initely working on dif­fer­ent options,” Van Dam said. Van Dam grows his own feed for the cows. They have about 4,000 acres of alfalfa. When the Van Dams ar­rived in the Valley in the 1950s there was between 50,000 and 60,000 acres of alfalfa being grown. Now there are about 6,000 acres, Van Dam said. With the water ad­ju­di­ca­tion case Van Dam said they had to cut back on their water usage. “When you’re cutting back about 50% you’re going to make changes,” Van Dam said. But like Kyle and Calandri, Van Dam is not ready to give up.